The Magnolia Bookcase Bed with a freestanding headboard for use with conventional mattresses. It is also available with Platform Frame and Standard Waterbed Frame. Matching furniture pieces include Master Dresser, Tri Mirror, T.V. Armoire and Night Stand. Other furniture pieces available in either white wash or regular oak finish. 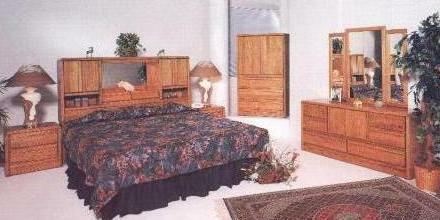 © Copyright 2011 Oak Land Furniture INC. All rights reserved.